Whenever I find myself getting apprehensive about the direction of the Spider-Man universe, Dan Slott finds a way to bring me back from the brink. After reading Avenging Spider-Man #20 earlier this month, I had some reservations about how Spider Ock was being characterized. Without Astral Peter there as Otto’s Jiminy Cricket, I questioned if I was reading a comic about a villain seeking redemption by developing an understanding of “power and responsibility,” or if the comic was just going to meander from misadventure to misadventure, with Spider Ock hatching mastern plans gone awry while silently criticizing the rest of the Marvel universe. 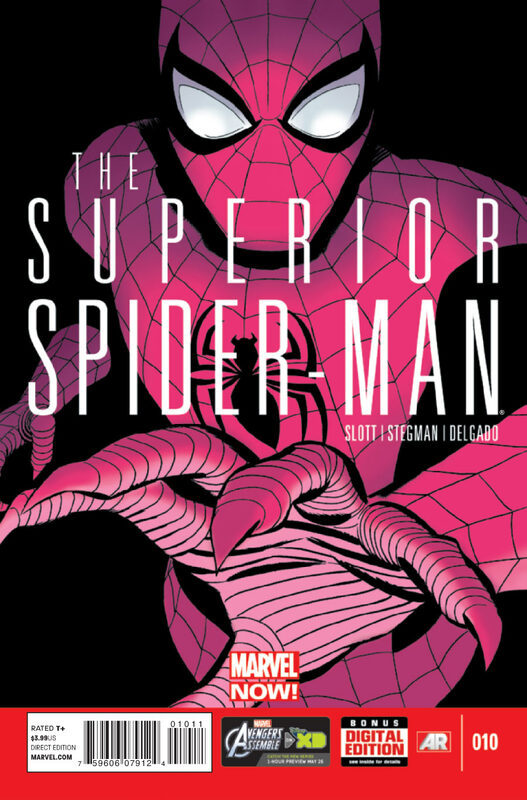 But Slott’s work on Superior Spider-Man #10 puts any doubts I may have had to rest. Otto is still very much a creep filled with an enormous amount of hubris in Superior #10. But he’s a creep I very much to want to read about based on some of the sub-plots Slott massages in. Without Astral Peter to interfere, Otto can now physically and intellectually dominate masterminds of the criminal underworld like the Owl, White Dragon and Tombstone in a way that his predecessor wouldn’t dare, but Otto’s successes under the mask are coming at a cost that he doesn’t fully understand yet. For a story without Peter Parker in physical or astral form, this comic sure had a familiar scent of Parker all over it. As Otto makes his way to meet Aunt May and John and Jonah Jameson for dinner, he smugly claims he has found the superhero work/personal life balance that Peter could never manage – that he would be able to be both responsible and a good nephew, co-worker, boyfriend, etc. But once he’s breaking bread with his “new” family, he’s immediately thrust into a world that is both simultaneously familiar and unfamiliar to a world Peter once lived in. After watching a video of Spider-Man beating up on a defenseless Screwball (back in Superior #6), May warns her “nephew” to stay away from that nasty old Spider-Man, echoing the woman’s advice going all the way back to Amazing Spider-Man #1. Otto promises May that he won’t associate with Spider-Man any more, but it’s a promise everyone but Doc Ock knows he can’t keep. What Otto doesn’t understand because of his own ego is that Peter never neglected his Aunt May because he didn’t love her like a mother. He neglected her because the guilt he felt from the death of Uncle Ben made his responsibilities as a hero trump his responsibilities as a nephew. And when Otto is put a similar situation where he has to choose one or the other, I’m imagine he’s going to choose Spider-Man, and it will probably be done in a way that is viewed as a betrayal by Aunt May. As for the unfamiliar, in a major reversal from 50 years of established stories, JJJ now views the new hardened Spider-Man as a true do-gooder. But as JJJ trends one way, the majority of other New Yorkers – including Jonah’s own father – are starting to see Spidey in a different light. New York City police officers, who have long been at odds with Spider-Man’s vigilante justice, are now covering up for him when being pushed for answers about Spider Ock’s cold-blooded murder of Massacre. But again, this reversal of tradition is being offset by some of Spidey’s long-time allies like Carlie Cooper and Captain Watanabe now digging deeper into why Spider-Man is suddenly so “different.” So, regardless of Spider-Ock’s new friends, there’s still a contingent of important people who view him as a “menace” and no amount of his self-described responsible do-gooding will change their opinions about him. 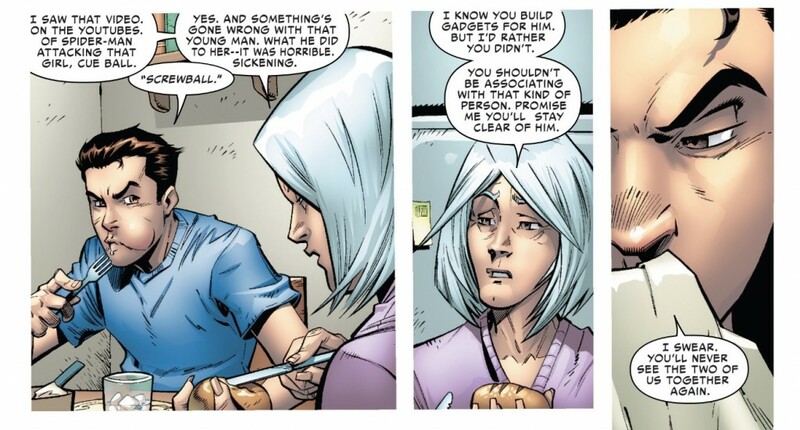 But perhaps my favorite Peter parallel Slott weaves into this issue pertains to Spider Ock’s love life. No matter how loyal and dedicated he was to the women in his life – Betty Brant, Gwen Stacy, Felicia Hardy and Mary Jane – Peter’s life as Spider-Man always found a way to interfere and inevitably end (in Gwen’s instance, fatally) the romance. 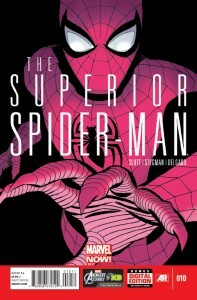 In Superior Spider-Man #10, Otto’s new found responsibility manages to fail two women in his life. There’s his old-flame MJ, who’s trapped in a burning building (started by the followers of the still unidentified “Goblin King”) and insistent that Peter will show up, when Otto is instead corralling another crime boss in Tombstone. And then there’s Otto’s new squeeze, Anna, who has just romantically made a move on “Peter,” seconds before he has to respond to a call for Spider-Man. Where have we seen this happen before? Again, Otto is oblivious and doesn’t understand the fact that he may believe the decisions he’s making as Spider-Man are justified, Peter learned a long-time ago that there always appears to be an equal and opposite reaction to whatever he does. Spider-Man can not have it all both as a hero and civilian. Case in point, while Otto mocks Parker’s tendency to aimlessly meander from one adventure to the next, a new Green Goblin is ascending into a seat of power underground, siphoning off man power from all of the mobsters Spider-Man has taken off the streets while he was assisting the NYPD. From my vantage, these are all building blocks for a very long-term story being developed by Slott about not only what it means to be Spider-Man, but what it means to be Peter Parker. Every subplot and scene transition is being written with such confidence and seamlessness right now, there is no question in my mind that these little details are very intentional and will not be forgotten. 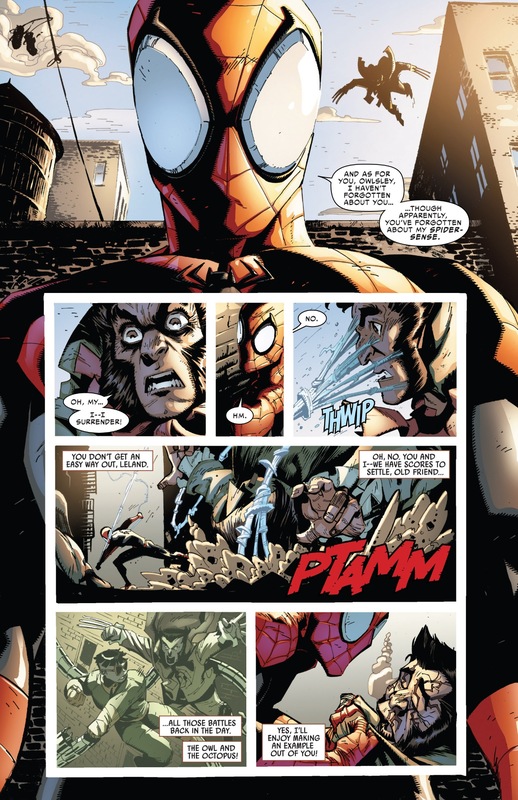 Since Amazing Spider-Man #700 was published, I’ve raised the question, “what is the Superior Spider-Man ultimately going to be about?” Superior Spider-Man #10 looks to be the clearest answer to that question yet. It’s about a man who thought with the right power, he could have it all, but he will ultimately learn with great power comes great responsibility. 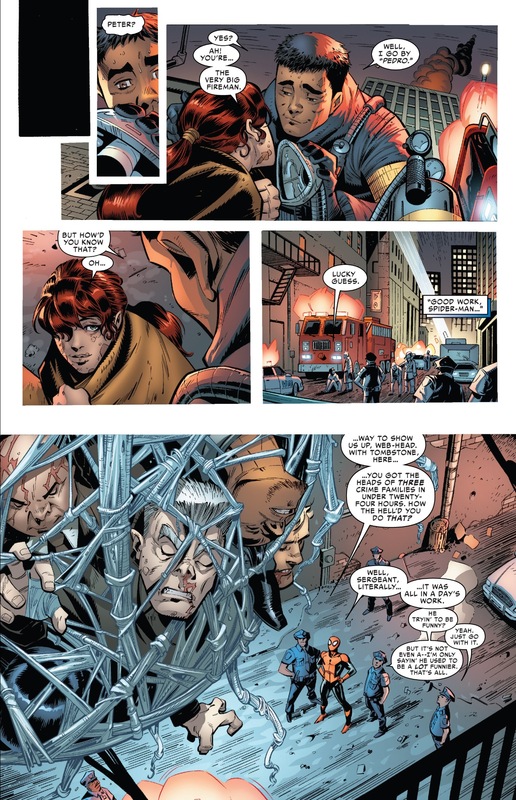 In this case, we’re talking about Otto Octavius, but the actions and experiences being captured in the pages of Superior Spider-Man clearly mirror Peter Parker, the Amazing Spider-Man. I think this is a brilliantly structured and constructed comic, but I’m not in love with some of the characterizations and plot beats that continue to be a bit muddled in this book. Massacre’s plan was to kill a lot of people publicly to destroy a brand and yet no one saw it… I think the MJ story is great except at this point I don’t really see MJ as a Silver Age girlfriend who would wait for her man to save the day. After all these years I believe MJ would be the first to kick down the door to get everyone out of that building. More to be discussed on the podcast in a couple weeks! I’m not reading Superior Spider-Man but I can respect good storytelling when I see it. 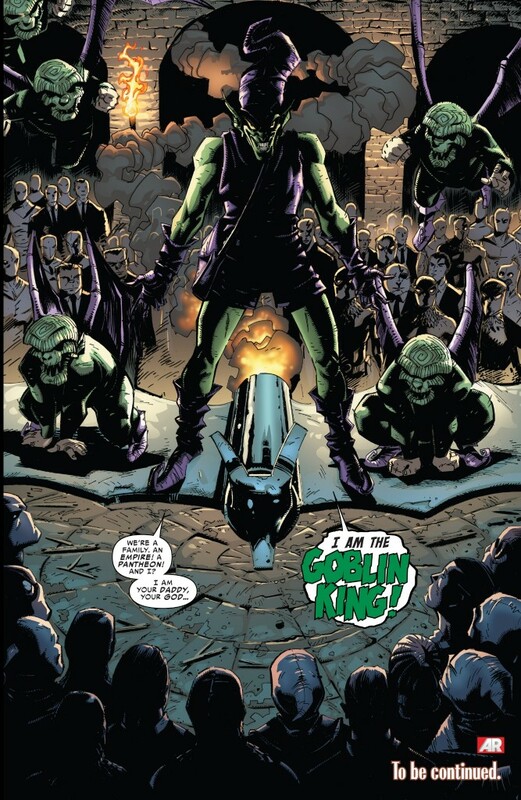 Slott is doing amazing things with the character that a lot of people are pissed about. Well their anger is warranted because they are reacting to what’s happening. Sadly, they’ll be Slott’s biggest (fake) fans when it’s all said and done. And 98% of the people that complained, will say it’s the best Spider-Man story they’ve read and they were on board from the beginning. i believe otto is going to give up his body after the goblin throws anna off a bridge then learning the meaning of responsibility and not wanting it.